Australia's Wild Deer - Australian Deer Research Foundation Ltd.
Six species of deer are established in the wild in Australia, having been introduced during the world-wide movement to 'share the world's most beautiful and useful things' as was the objective of the acclimatisation societies which were active in the latter half of the 19th. century. Of the many species which the acclimatisation societies and private individuals introduced, only the chital (Axis axis), fallow deer (Dama dama), hog deer (Axis porcinus), red deer (Cervus elaphus), rusa (Cervus timorensis) and sambar (Cervus unicolor) remain. During the course of the widespread exchange of species which took place during those years, some mistakes which were to have horrific consequences occurred as animals, plants and insects finding circumstances to which they were uniquely suited, exploded into populations which could not have been dreamed of at the time. Other introductions were less spectacular or failed to survive, but those that did became in many instances exactly what their benefactors set out to achieve - beautiful and useful things. We only have to look around us to see that almost all of our food resources, for instance, are provided by introduced species. This is the Indian Spotted Deer or chital - one of the most beautiful of the 42 species (197 subspecies) of deer recognised by Kenneth Whitehead in his Encyclopedia of Deer. 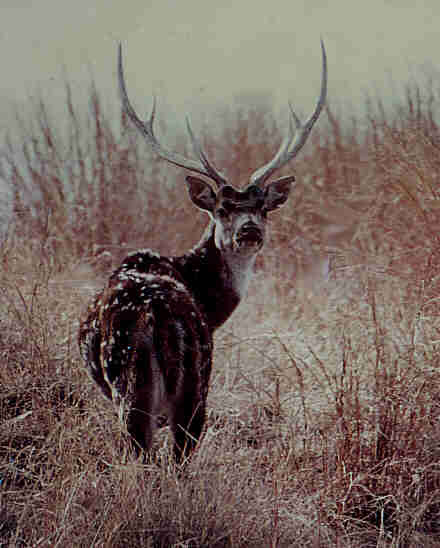 A chital stag attains a height at the shoulder of about 86cm and a weight of 80kg; hinds are proportionally smaller (75cm, 50kg). The coat varies from light to dark brown with permanent white spots which appear as broken lines running along the body. A dark stripe (dorsal stripe) runs along the spine and the throat is a prominent white. Typically antlers, are three tined. The chital was the first species of deer introduced into Australia in the early 1800s by Dr. John Harris, surgeon to the New South Wales Corps and he had about 400 of these animals on his property by 1813. These did not survive and the primary range of the chital is now confined to a few cattle stations in North Queensland near Charters Towers. While some of the stock originated from Sri Lanka (Ceylon), it is likely that the Indian race is also represented. Behaviourally, the chital is gregarious (a strong herding instinct) and, originating in tropical regions which do not have the extreme seasonal variations of Europe, is irregular in its breeding patterns. Young are born throughout the year. Preferred habitat is a well watered open forest environment. A close relative of the chital is the much smaller hog deer or Para. Stags attain a shoulder height of about 70cm and weight of 55kg and hinds are proportionally smaller (60cm, 30-35kg). The hog deer was first liberated in Victoria in 1865 and has established its range in the coastal regions of South and East Gippsland. Its coat ranges from a uniform dark brown during winter to a rich reddish-brown in summer at which time light coloured spots along the sides and on either side of the dark dorsal stripe are visible in individuals. Antlers are normally three tined, but extra points are not uncommon. In behaviour, the hog deer differs from the chital in that while it may be seen in numbers on attractive feeding areas, it lives and acts as an individual. This can probably be attributed to its evolution in the tall grasslands (up to five metres high) along the major rivers in Northern India and Nepal. In this dense grass jungle, herding would not have been a practical option. 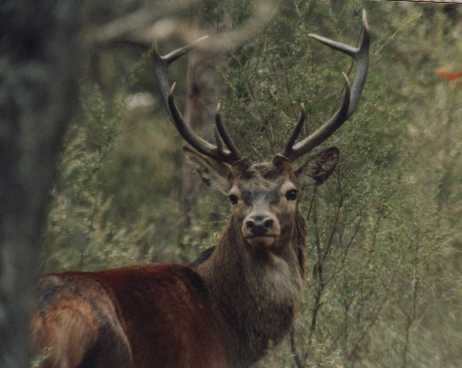 In common with many other tropical species, breeding activity is spread throughout the year, although in Australia a calving peak occurs in late winter and spring, roughly coinciding with antler casting in the stags. Rusa are closely related to the sambar, but smaller in stature (stags about 110cm at shoulder, weight about 140kg with hinds proportionately smaller (90cm, 80kg). Coat colour is a uniform grey-brown, variable between individuals and season. 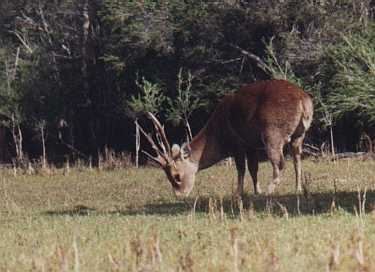 The body hair is coarse and notably sparse by comparison with other deer. Antlers are typically three tined with the beams forming a characteristic lyre shape. The original stock of rusa which reached New South Wales from New Caledonia between 1861 and 1885 was the Javan race - a smaller subspecies, the Moluccan rusa, is located on some of the offshore islands north of the mainland. Liberations were made in New South Wales, Victoria and Western Australia with the surviving population centred around Sydney's Royal National Park and its surroundings. A tropical species, the rusa in Australia is gregarious and very vocal in communicating with others of its kind. The breeding season is said to be irregular with a peak in mating behaviour in July and August, during which time stags wallow extensively and exude a strong musky odour to attract hinds. A feature of the rutting behaviour is the 'roaring' of the stags which also 'decorate' their antlers with clumps of grass in displays designed to intimidate their rivals. 'The dominant transplant' as Arthur Bentley termed it in his An Introduction to the Deer of Australia, the sambar is the largest of the deer species established here in the wild. Stags stand at about 127cm at the shoulder and weigh around 225kg (hinds 115cm, 150kg), although much heavier weights have been recorded in individuals. Antlers are typically three tined, but despite this simplicity, there is a wide variety of styles. Coat colour is normally brown but individuals of grey to almost black are seen. Sambar were first released in Victoria in 1863 and while the original animals were received from Ceylon (the Ceylon Elk), others were also obtained from India and Malaysia. Following subsequent releases, the sambar has extended its range throughout the Central Highlands of eastern Victoria and into southern New South Wales. 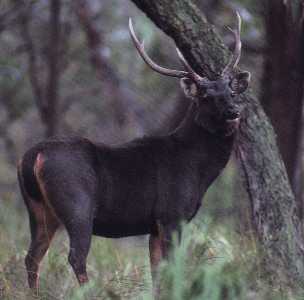 Behaviourally, sambar live as individuals or in small groups; as with other tropical species, breeding is irregular, with seasonal peaks in May/June and from September to November. A very interesting and complex behaviour is proving difficult to unravel due to the extreme elusiveness of this magnificent animal. The sambar is well in control of most situations it encounters in the bush, but for those rare occasions when it is surprised, the stag's alarm bark (honk) is something which has to be experienced to be believed. It loses nothing by comparison with a close encounter with the air horn of a MACK truck in the middle of a still, dark night! Fallow deer were first introduced into Tasmania prior to 1850 with releases taking place in all of the eastern states of Australia - they are not known to be present in either Western Australia or the Northern Territory, but populations are thriving in all other states. Of more recent times, it is believed that escapes from deer farms, particularly during troubled times within the industry, may have contributed to expansion of the fallow deer range. A long term inhabitant of Europe with its severe winters, fallow deer have developed a breeding strategy in which a defined mating season or rut (mid autumn) results in calves being born in late spring/early summer - the most favourable time for the species to rear its offspring. During the rut, bucks attempt to attract the does to rutting stands from which they advertise their presence by 'groaning' or 'troating' (a sound not unlike a loud belch) as they continually move about their stands. Fierce fights in which serious injuries can occur may break out at this time. Fallow deer prefer an open forest environment with access to denser escape cover and pasture for feeding grounds. They are gregarious and with their exceptional eyesight, evolved no doubt to suit the type of habitat they prefer, can detect movement at a great distance. Alarm is immediately communicated to other members of the group. Their eyesight is less effective at dusk, when some liberties not possible during periods of strong light can be taken when trying to approach them. The deer of literature as it has sometimes been referred to is due to the immense volume of material written about it. Like the fallow deer, the red deer and related species are widely spread throughout the world. The second largest of the deer in Australia, a stag stands about 120cm at the shoulder and weighs about 160kg (hinds 90cm, 90kg). Coat colour ranges from a dull brown in winter coat to a rich reddish brown in summer; a permanent straw-coloured rump or caudal patch is retained throughout the year. Antlers are a complex combination of long beams with numerous points or projections, the terminal tines at the upper end of the beams sometimes forming a cuplike shape. A stag with six points on each antler, comprising brow, bez, and trez tines (pronounced 'bay' and 'tray') on the beam and with three terminal tines (twelve in all for the two antlers) is referred to as a 'royal', but exceptional park bred deer have been known to have in excess of 50 points in all. Introduced into Australia from Britain about 1860 (predominantly from Windsor Great Park -- a gift from His Royal Highness Prince Albert), releases subsequently took place in all mainland states. The most successful of these releases was in Queensland, however Victoria retains a thriving population in the Grampians National Park and its surrounds. In common with the fallow deer, and for the same reason, red deer have a well defined rut or mating season. This is characterised by stags wallowing in mud or dust and by spectacular 'roaring' (this has been likened to that of a lion roaring) as they attempt to intimidate rivals and round up a harem of hinds. Fighting between closely matched stags may break out when intimidatory displays (threats) are unsuccessful in establishing dominance. Red deer have adapted to a wide range of habitats ranging from treeless expanses of heather-and bracken covered hills and mountains typical of Scotland, to the densely forested range in parts of Europe. In open range, red deer are capable of detecting the slightest movement at extraordinary distances. In dense cover, eyesight, particularly on stationary objects, is not as effective, but the acute senses of hearing and smell more than adequately compensate.